For the past decade Total Escape has been here for you! Weekend getways for all locals, all Californians - and a unique guide for tourists seeking California, Off the Beaten Path. Real places with real photos, new landscapes and links. Back roads to coastal cliffs, small villages to ghost towns, remote regions, secluded camping spots, hot springs, fly fishing, antique shopping, historic bed & breakfasts... it's all here. 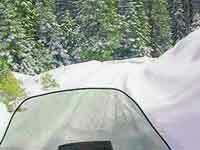 Whether your a seasoned pro or a first time beginner, snow mobiling in the Sierras can be a fantastic experience. See the hidden backcountry with a winter wonderland fresh coat of snow. Some of the best uncrowded areas to explore are the Sierra NF, near Huntington Lake, certain parts of Tahoe NF or Northern Cal, near Shasta. Mammoth & Tahoe just are gettin good dumpings. The recent winter storm track is dipping our way folks! That means the Sierra Passes are getting the dumping we need. Lifts are open & ready for your holiday cheer. Now you can reserve a full ski weekend online! 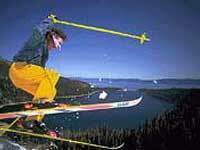 Heavenly & Squaw have ski deals! Book ski condos or mountain cabins.